Will power cuts be a way of life in the future? Could Britain be facing a widespread, catastrophic power cut in the future? The short answer is yes. "Unless we make decisions now our electricity will start to run out within five years," Professor Ian Fells, World Energy Council. 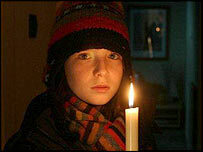 In our scenario, set in the winter of 2010, Britain is struggling to generate enough electricity to cope with demand. Click here to watch a special Newsnight debate on the issue. We've used most of our reserves in the North Sea and are already heavily dependent on imported gas to generate electricity, the majority of which we buy from Russia. But a terrorist attack on a gas pipeline in Russia has a disastrous effect on Britain. We see the crisis from the point of view of Bill McAllister, the newly-appointed energy minister, who thought back-up systems were in place. However, after the Russian gas pipeline goes down, he finds he quickly runs out of options. By evening rush-hour, whole sections of the country begin to lose power, including the capital city London. Very quickly the south east of England is plunged into darkness; householders are left with no water or electricity, traffic is gridlocked, tube trains are stranded underground and airports closed. As the situation worsens emergency services are affected and people's lives are put at risk. "The effect in the UK could be very quick indeed. "This is a very, very difficult problem to solve, and we just have never attempted to solve a problem of this magnitude in this country ever before," says Kelvin Beer, Gas Strategist, Deloitte Petroleum Services. Has the deregulated electricity industry put us at greater risk of black-outs? Do the current crises in coal-fired and nuclear power generation - and the fact that Britain's reserves of gas are running out - mean that power cuts will be a way of life in the future? During the programme, we interview today's energy experts who give us their view on what's happening in energy policy. They explain how falling prices, rising consumption, industry regulation and privatisation have, and could, affect Britain's electricity business. "The trouble is there's no clear line of authority, there's no clarity as to who exactly is responsible," says energy economist Dieter Helm. "If you want the lights to stay on, if you want security of supply, if you want what a modern economy needs you have to be absolutely clear what your priorities are, who has the right powers and how they will be exercised, then the market works. "But we're a long way from that point yet, and that is the challenge that should be at the Department of Trade and Industry's door morning, noon and night. " If... the lights go out was broadcast on BBC Two on Wednesday, 10 March, 2004. The government and Ofgem have a statutory responsibility to ensure security of energy supplies. The recent Energy White Paper made clear that maintaining security of supply is one of the four goals of government energy policy. "Contrary to what has been reported, the market-driven approach to delivering energy supplies works. NGT asked for greater capacity over the winter. Prices rose and this encouraged companies to bring plant back into service so that it was available to generate more electricity if it was needed. The margin rose from 16% in the autumn to over 20% throughout the winter thanks to this approach and, since privatisation, there has never been an occasion when supply has not been sufficient to meet demand. Ofgem is the regulator for Britain's gas and electricity industries. In these factsheets, Ofgem explains how our gas and electricity is supplied.